Our classic designer 14k yellow gold three stone engagement ring displays three beautiful diamonds in elegant trellis settings. 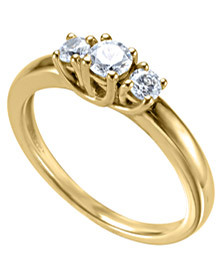 The setting can hold a center stone ranging from .23 carats to 1.10 carats. The sidestones all have a color of G-H, a clarity of SI and a total carat weight without the center stone of .25 carats.